Enjoy some big flavor -- in a bright dip! 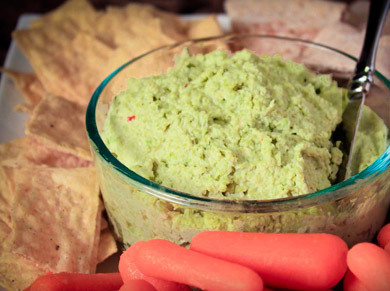 Made with fresh, healthy ingredients, this dip is sure to satisfy, energize and entertain. The edamame bean is rich in low calorie proteins making it ideal for athletes who are vegetarians. It offers the nine essential amino acids that the human body cannot manufacture. Every half cup of edamame contains 4 grams of fiber, lowering levels of cholesterol and making you feel full for a longer period of time. 1. Cook the edamame according to package directions. 2. Puree the cooked edamame, water, soy sauce, ginger, hummus, vinegar, garlic, nuts, salt and pepper in a food processor until smooth. 3. Chil at least one hour before serving. For best taste, make ahead and refrigerate for up to 4 days. Edamame seeds contain vitamin B, C and E and are also a rich source of minerals like calcium, iron, manganese, phosphorous, magnesium and copper. Edamame beans contain isoflavones that protect your heart from the risk of developing heart disease. At the same time they help lower the cholesterol levels in the blood. Used effectively in the place of meat in meals, they are a rich source of vitamin K. Vitamin K and folate can aid in the production of blood cells while the folic acid is essential for fetal development in expectant women. Edameme seeds contain antioxidants which cleanse the body and thus freeing it from radicals and toxins. This strengthens the body and boosts the immune system. The edamame seed alsocontains anti-inflammatory properties and is most ideal for those with arthritis and any other inflammatory condition. When taken as a side dish or snack, it can be very healthy for asthmatic people as it heals inflamed breathing passages.